Position an oven rack in the lower third of the oven and preheat to 225 degrees F. Line 2 baking sheets with parchment paper. For the meringues: Combine the egg whites, cream of tartar and salt in the very clean bowl of a stand mixer fitted with the whisk attachment. Whisk on medium speed until foamy, about 1 minute. Increase the speed to medium-high and beat until thick and opaque, about 1 minute more. Gradually add the confectioners' sugar, 1/4 cup at a time, and beat until stiff shiny peaks form, about 5 minutes more. Scoop the meringue using a 2-inch ice cream scoop and scrape off excess with the back of a knife to flatten. Unmold each scoop onto the prepared baking sheets, leaving 1 1/2 inches between each. Use the back of a metal tablespoon to make a shallow well in the center of each mound that will hold the "yolk." Bake until the meringues are dry and crisp on the outside, about 2 hours. Let cool completely. For the curd: Simmer 1 inch of water in a medium saucepan over medium-high heat. Combine the egg yolks, sugar, lemon juice and zest in a medium metal bowl and whisk until smooth. Place the bowl on top of the saucepan (make sure the bottom of the bowl is not touching the water) and whisk until the curd is thickened, light yellow and coats the back of a spoon, about 8 minutes. Remove the curd from the heat and use a rubber spatula to stir in the butter, one piece at a time, allowing each addition to melt before adding the next. Transfer to a clean container and press a sheet of plastic wrap directly against the surface of the curd. Chill thoroughly, at least 3 hours and up to 1 week. 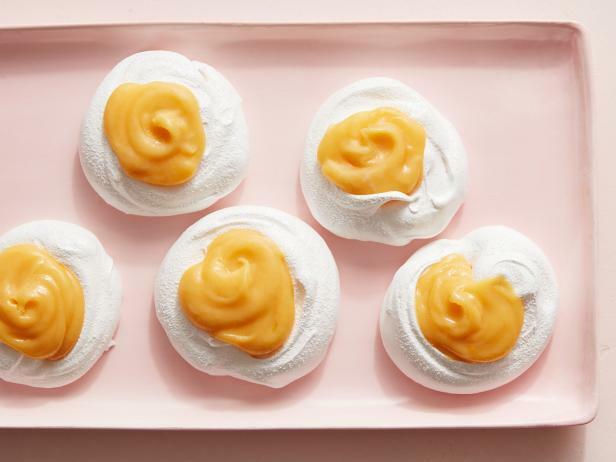 To serve, spoon 1 tablespoon of curd into the well of each meringue and serve immediately. Pot Roast 101: Picking a Roast Plus a Great Recipe!